The Logitech Squeezebox Controller App ("Squeezebox Controller App") is a FREE smartphone / tablet app to control your Squeezeboxes. Not to be confused with the Squeezebox Controller, which is a hardware product. 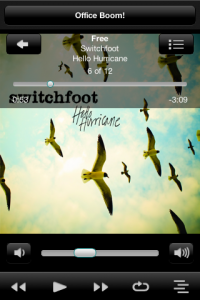 It is one of several remote control apps for Android. 5.1.1 Which Squeezebox Can You See on Choose Players menu? The Squeezebox Controller App finds and controls your players using MySqueezebox.com or your home PC or Mac running Squeezebox Server. Any Squeezebox you want to control must be turned on and successfully connected to either one. Your choice determines which players you can see. What you see depends on how you have your Squeezeboxes configured. These typical scenarios will help you choose a wireless configuration that works for you. How you want to set up your wireless configuration depends upon your home Squeezebox setup. Once you are away from home, you can see only your Squeezeboxes connected to MySqueezebox.com. You are unable to see Squeezeboxes connected to your home Squeezebox Server unless the Squeezebox Controller App is on the same Wi-Fi network as Squeezebox Server. It is recommended that you enable Wi-Fi whenever you use the Squeezebox Controller App. 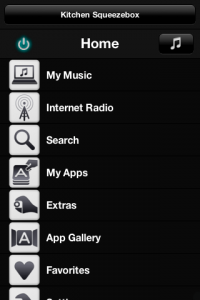 Search for Logitech or "Squeezebox" or look under Music & Audio category to find this app. If you follow the instructions above and do not find the app, that's because your device does not meet the minimum Android requirements for the app. Hit menu while on your home screen, go to Settings, select Applications, and there should be a box for you to check that says “Unknown sources” (or something similar). If you can’t find this, you should get a message the first time you try and install a 3rd party app allowing you to check it easily then. Download the Squeezebox Controller App .apk file to your phone. From the downloads app, start the Squeezebox .apk file. Follow the instructions to install the file. Using iTunes, go to STORE heading and choose iTunes Store. Then click on App Store. 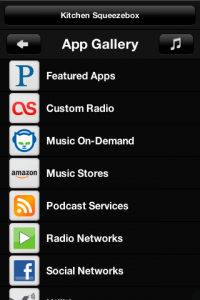 Search Store for Logitech or Squeezebox or look under Music category to find this app in either iPhone or iPad areas. If you follow the instructions above and do not find the app, that's because your device does not meet the minimum iOS requirements for the app. Which Squeezebox Can You See on Choose Players menu? To go to this menu, touch the name of your player at the top of the screen. Search: go the Global Search feature as available from the Squeezebox home menu. The Squeezebox Controller App lets you control any Squeezebox registered on your MySqueezebox.com from anywhere in the world. This allows you to control Squeezeboxes that you can't see or hear. On mobile phones you can only use the app in landscape mode if this is enabled in Settings->Advanced->Screen Layout. On tablets you'll get an advanced split view when in landscape mode. It gives you quick access to the player controls like volume, transport and artwork while browsing the menus in a separate panel. View latest release notes here.